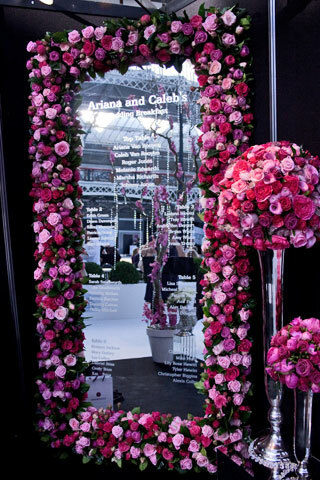 In her guest blog for New Covent Garden Flower Market, Rona Wheeldon of Flowerona reports on the sensational displays by Flower Market Florists in the Designer Flower Zone, a collaboration between the National Wedding Show and NCGFM to showcase the best in professional wedding flowers. 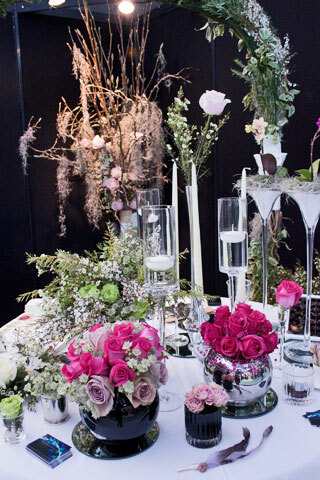 I hope you enjoyed reading Part 1 of my visit to the National Wedding Show last month, where I featured three of the Flower Market florists' stands in the Designer Flower Zone. Part 2 features three more florists - Wild About, Linda Cottee and Elizabeth Marsh. It was lovely to meet Leanne and I was so taken by her stunning stand, which was a riot of colour, from vibrant pinks and reds, to purples and lilacs. 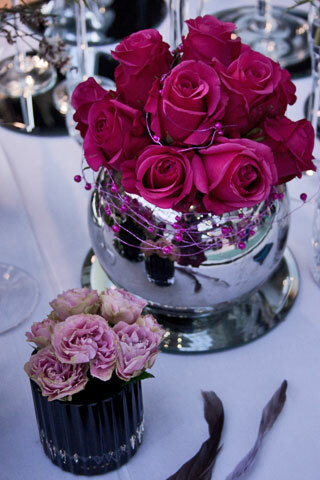 Gorgeous pink hues were used to decorate a huge mirror, which was complemented with domes of beautiful roses. Pretty astrantia and ranunculus with their layer upon layer of delicate petals, were also included in the arrangements. 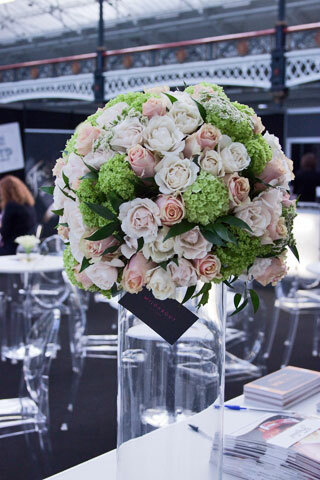 Wild About were also responsible for creating floral arrangements for the public areas, including this stunning design of pale peach and cream roses, combined with guelder rose. 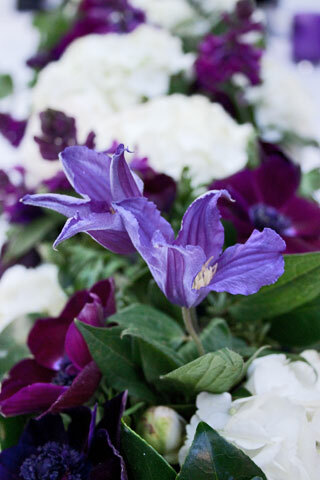 Purple is a colour close to my heart and Linda’s stand featuring arrangements with clematis was breath-taking. I loved the way she’d decorated her main display table. The velvety anemones had such an amazing depth of colour and contrasted beautifully with the white hydrangeas, clematis and foliage. 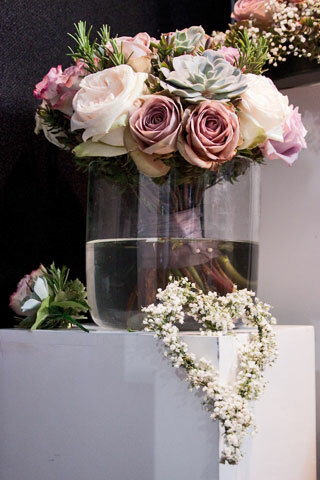 And for those who prefer a more muted colour scheme, there were vintage shades of roses matched with succulents and rosemary sprigs…and a very pretty gypsophila heart. I was delighted to meet Elizabeth at the show and loved her arrangement of cerise pink roses, enhanced with decorative wire. 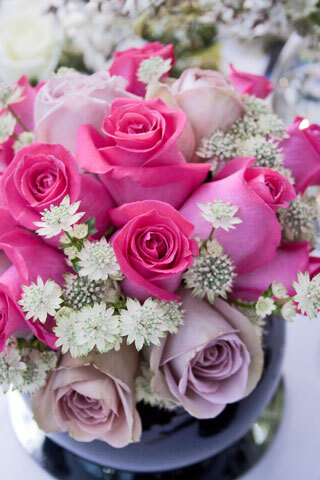 And roses in differing pink tones were combined with dainty white astrantia to create this lovely arrangement. Elizabeth had also created a beautiful selection of arrangements with a white and green colour theme, including a wonderful floral arch. 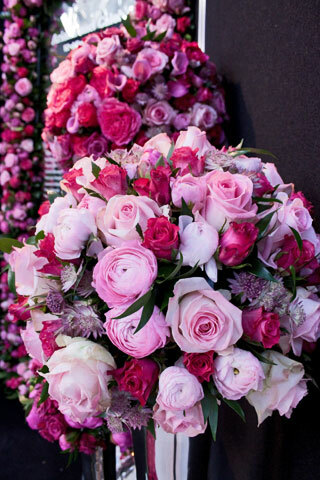 I hoped you’ve enjoyed seeing all the stunning arrangements created by the New Covent Garden Flower Market florists. 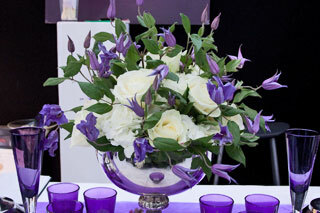 I understand that the show was a great success with a large number of enquiries for wedding flowers. If you’d like to take part next year, simply email your details to info@cgma.co.uk, marking the subject as 'Designer Flower Zone'. And don’t forget to click on the thumbnail images on the right hand side to see more of the stunning floral arrangements on display.